Cathie Serrao, from Bushey, is on a mission to raise funds and awareness of pancreatic cancer, which is the UK’s fifth biggest cancer killer. On 30th July 2017, she will take part in the world’s largest cycling event, Prudential Ride London, in memory of her uncle who sadly passed from pancreatic cancer 5 years ago. 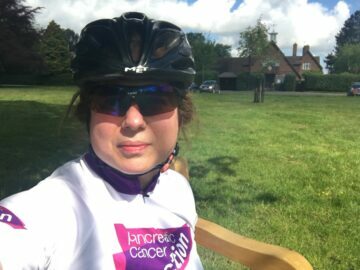 She is completing the challenging 100-mile bike ride, just one week after her 40th birthday, to raise money for Pancreatic Cancer Action who aim exist to save lives by improving early diagnosis of pancreatic, which has a survival rate of just 5%. Ali Stunt, Founder of Pancreatic Cancer Action, said: “We are delighted that Cathie is giving her time to support Pancreatic Cancer Action. Previous Article '1 in 10 patients with new onset diabetes had pancreatic cancer' Next Article The Sun's Health Awards; Who Cares Wins!